Since my ovarian cancer went into remission, and recalling the 2011 bout with breast cancer, I’d wanted to share what I’d learned for those who might benefit. I’d tried a few times to capture my thoughts and suggestions. I could not. There was just too much swirling around in my head to write a coherent piece. Then came CH2 writer Linda Hopkins to the rescue. I will always be grateful to her for taking over an hour of interview and turning it into the very readable, warm article it was. Linda produced exactly what I’d envisioned and more. And then, Maggie, your incredible eye for photography and layout made the piece call to readers. And call, it did! Since June, I have had numerous emails, letters, phone calls and personal conversations with your readers. The article has been forwarded all over the country and even abroad. My hope of sharing the story to help others was realized due to the CH2 team’s amazing talent and heart. Since my interaction with ya’ll, I eagerly await delivery of each month’s issue. Knowing the care and time and professionalism that makes CH2 what it is has made me a lifelong fan. 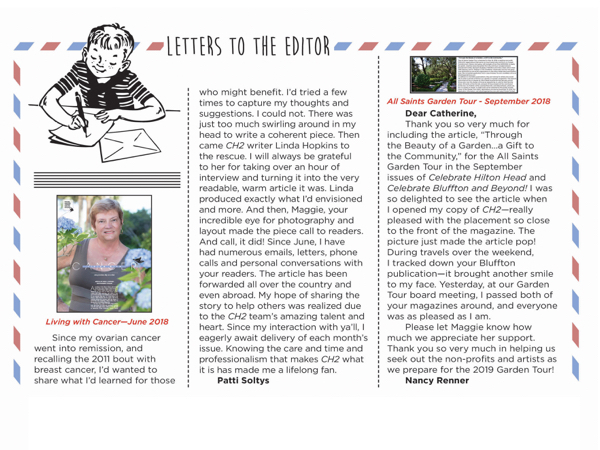 Thank you so very much for including the article, “Through the Beauty of a Garden…a Gift to the Community,” for the All Saints Garden Tour in the September issues of Celebrate Hilton Head and Celebrate Bluffton and Beyond! I was so delighted to see the article when I opened my copy of CH2—really pleased with the placement so close to the front of the magazine. The picture just made the article pop! During travels over the weekend, I tracked down your Bluffton publication—it brought another smile to my face. Yesterday, at our Garden Tour board meeting, I passed both of your magazines around, and everyone was as pleased as I am. Please let Maggie know how much we appreciate her support. Thank you so very much in helping us seek out the non-profits and artists as we prepare for the 2019 Garden Tour!